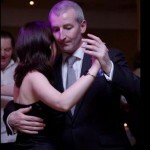 I expect time will prove me right when I say few religious occasions I witness will be laden with such historical resonance as the first profession of perpetual religious vows of a Knight of the Sovereign Military Hospitaller Order of St. John of Jerusalem of Rhodes and of Malta to occur in Ireland since the Reformation. 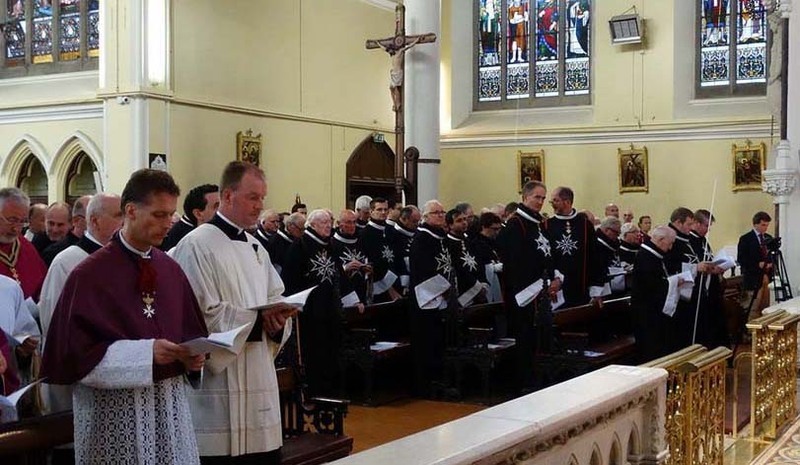 The solemn profession of Fra’ Paul Caffrey, made before His Most Eminent Highness The Prince and Grand Master Fra’ Matthew Festing, took place during High Mass in the Church of St. Kevin on Harrington Street in Dublin on Saturday 26th July 2014, the Feast of St. Anne. As the celebrant the V. Rev. 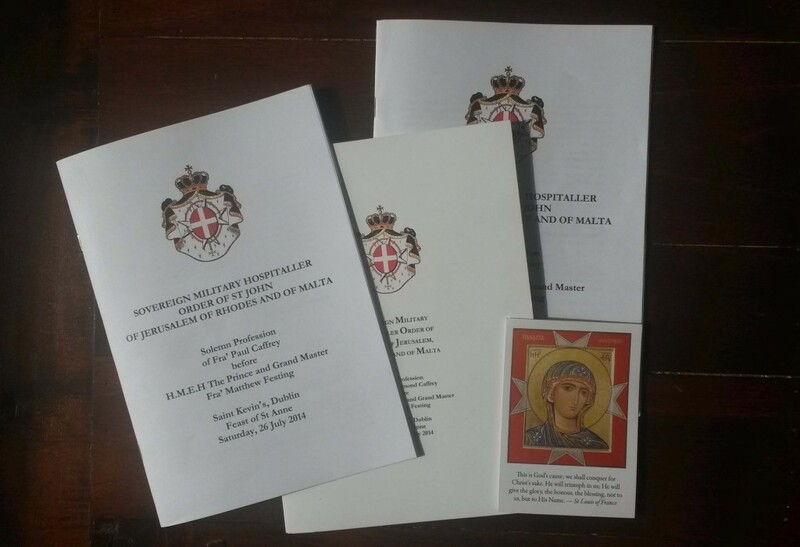 John Osman, Magistral Chaplain of the Grand Priory of England and the Irish Association of the Order reminded the congregation in his homily, it has been four hundred and seventy four years since the dissolution of the Order in Ireland and the country’s last Professed Knight of Malta. 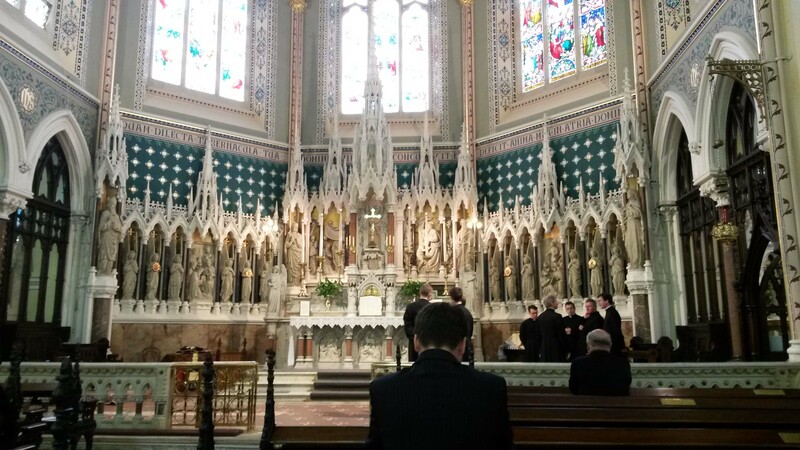 St. Kevin’s Church, Harrington Street before the Solemn Profession. 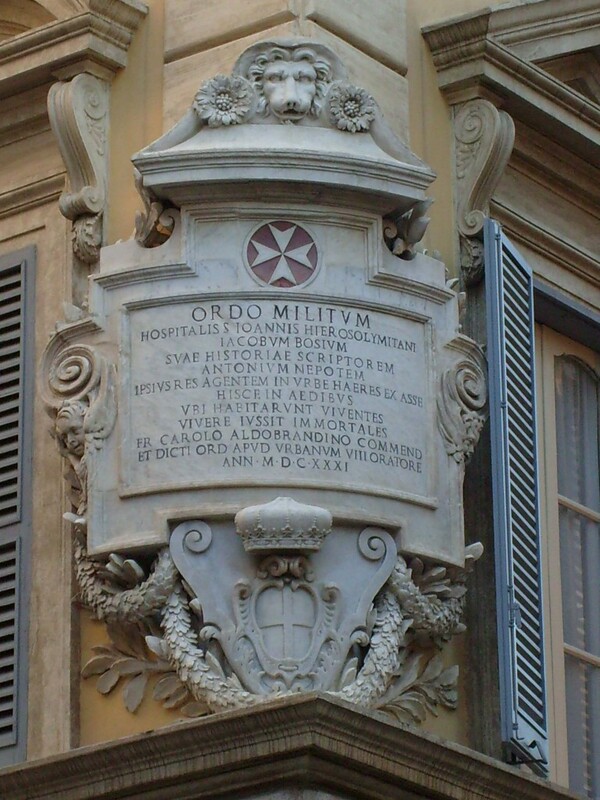 The oldest surviving chivalric order in the world, the Knights Hospitallers were founded in the Holy Land in 1048 as a hospital to care for poor and sick pilgrims and in 1113 Pope Paschal II issued the Bull ‘Pie Postulatio Voluntatis’ whereby the hospitallers became a Religious order of knights. Throughout the medieval and into the modern period, the knight brethren of the Order were drawn from the nobility of Europe, vowed to poverty, chastity and obedience and lived a monastic life in accommodation as much akin to barracks as convents. A military as well as Religious Order, the knights were committed to defend the Faith with their swords while simultaneously serving God through prayer and service to the sick. The monk-knights arrived in Ireland circa 1174 and established their largest Irish hospital at Kilmainham near Dublin. By 1558, during the Protestant Reformation under King Henry VIII and Elizabeth I, the Order was suppressed in Ireland and was only re-established here in 1934 as the Irish Association of the Order of Malta. In keeping with the charism of the Order, ‘tuitio fidei’ (the nurturing, witnessing and protection of the Faith) and ‘obsequium pauperum’ (‘serving Our Lord’s the Sick and the Poor’) the Irish Association established the first Order of Malta Ambulance Corps to provide first aid, ambulance and casualty services across the country. The first Corps unit was established in 1938 in Galway and the Order now has units in over eighty locations with over four thousand volunteers across the island of Ireland. In the modern world the vast majority of knights and dames of the Order are non-professed members and compose two of the three Classes into which the Order members are divided. Only the professed Knight of Justice constitutes the First Class of the Order. He takes three monastic vows of poverty, chastity and obedience, but unlike other monks the Professed Knight is not obliged to live in community. 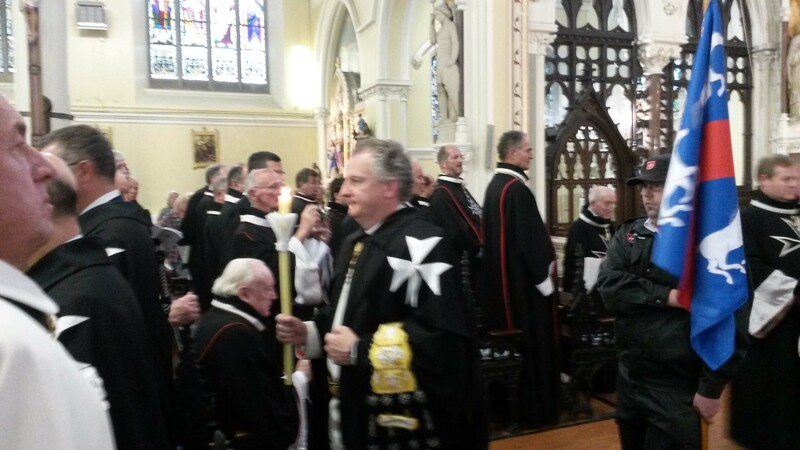 All knights and dames of the various classes of the Order are full members of what is a religious order. However, the professed Knights of Justice and Chaplains are Religious in terms of Canon Law and as such are regarded as ‘the essential core or heart’ of the Order. Fra’ Matthew Festing OBE, TD, DL, 79th Prince and Grand Master of the Sovereign Military Hospitaller Order of St. John of Jerusalem, of Rhodes and of Malta. 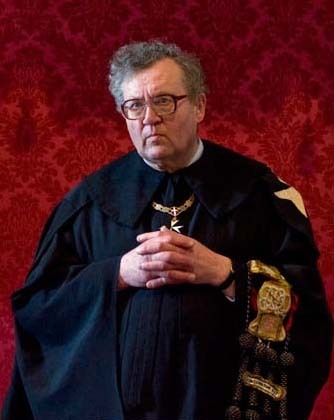 Elected for life in 2008 and the third Englishman to hold the office, his full title refers to the Grand Master as the ‘Most Humble Guardian of the Poor of Jesus Christ.’ His maternal ancestor Sir Adrian Fortescue, also an English Knight of Malta, was beheaded on Tower Hill in 1539 during the reign of King Henry VIII for refusing to take the Oath of Supremacy. One of ten martyrs of the English priory executed as the Crown was suppressing and dissolving the priory, he was beatified in 1970. Sir Adrian was intimately connected with the Irish aristocracy, his daughter being the wife of ‘Silken Thomas’ Fitzgerald, 10th Earl of Kildare, who had rebelled against King Henry VIII and been executed with his uncles in 1537. To appreciate the uncommon privilege of witnessing at first hand a Knight of Malta’s profession of perpetual vows, it is worth considering that in the mid 1990s, at which time the Order was composed of approximately ten thousand Knights, Dames and Chaplains across the world there were little more than forty Professed Knights of Justice. Today the Order has approximately thirteen and a half thousand members and of that number there are approximately sixty Professed Knights of Justice worldwide. Given the rarity of the occasion, it is worth giving in brief detail a description of the ceremonial involved. Mass was celebrated according to the Latin Extraordinary Form of the Roman Rite and arriving early I found myself ushered by Ivan Healy, Knight of Magistral Grace of the Order and Director of Ceremonies to a fine vantage point from which to view the ceremony. To my right were various members of other chivalric orders. Across the aisle sat the main body of Knights of Malta in order of rank and office, identifiable from the piping and variations of the cross outlined in white upon their black mantles. 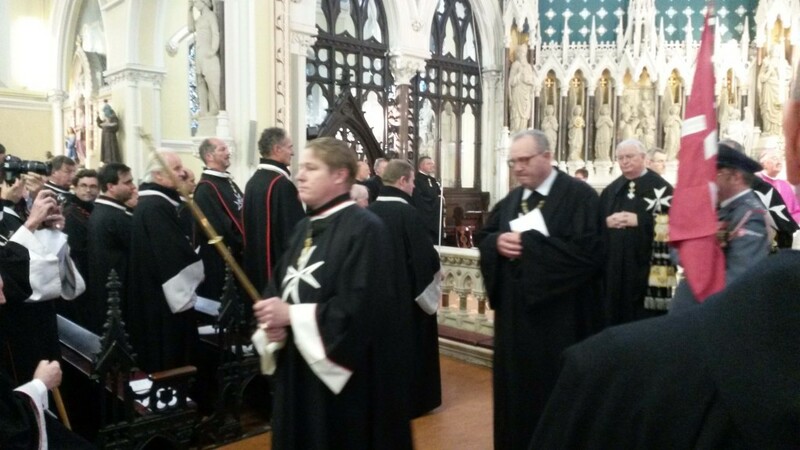 John McGrath KM ushering his fellow knights, dames and attending Religious and clergy to their assigned seating during the entrance procession. The Prince and Grand Master, in the presence of Most Rev. 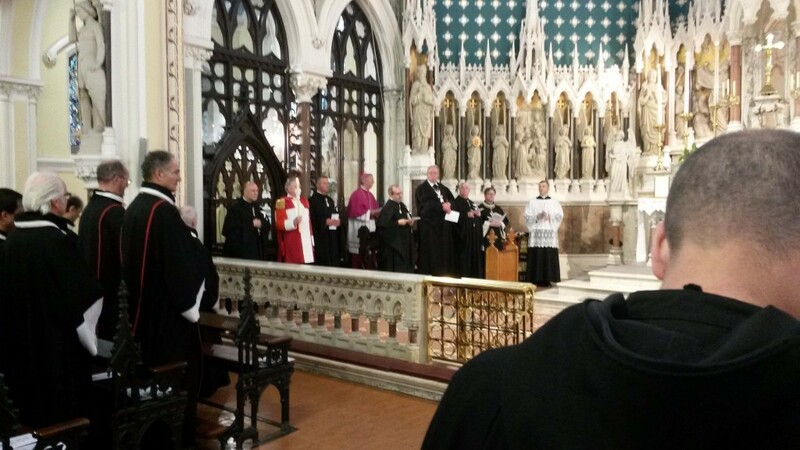 Diarmuid Martin, Archbishop of Dublin, surrounded by Professed Knights of Justice on the sanctuary. 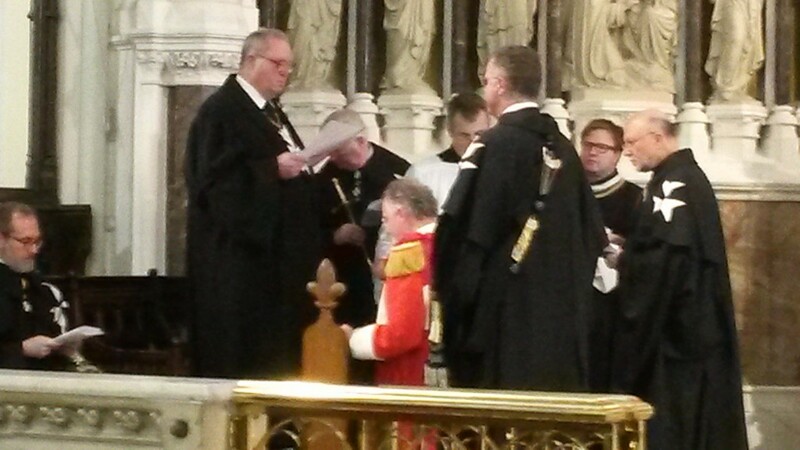 Fra’ Paul Caffrey, wearing the distinctive red military uniform and surcoat of a knight, carries a lighted candle symbolising Charity for much of the Mass. An historian and lecturer at Dublin’s National College of Art and Design and a knight of the Order for many years, he underwent five years of preparation in advance of taking his final vows. Rich symbolism and centuries-old tradition run through the ceremony of profession of perpetual vows. The ‘Giving of the Sword’ forms an early part of the ceremony. Following the lesson, the professing knight kneels before the Grand Master, asking ‘to be counted and enrolled in the Military Order of the Knights of the Religion of Saint John of Jerusalem.’ Promising to defend the Church and the Faith, he is counselled by the Grand Master to strive never to desert the colours under which he will stand, for should he do so, he will be expelled from the Order ‘in the greatest of disgrace and infamy.’ Mindful of the charism of the Order, he promises to have ‘particular care and concern for those who are poor, dispossessed, orphaned, sick or suffering’ and is presented with the unsheathed sword, with the attendant caution of the Grand Master never to harm any innocent person. Fra’ Paul, flanked by two Professed Knights, kneels before the Prince and Grand Master before being presented with his sword. In a dramatic flourish in keeping with tradition, the professing knight at this point stepped to the altar rail and, in the direction of the congregation, brandished the sword three times above his head as a symbolic threat to the enemies of the Faith. Kneeling again before the Grand Master, he wiped the blade upon his arm before sheathing. 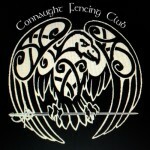 Even this seemingly minor gesture of cleaning the blade too forms an important part of the same symbolism, its purity and spotlessness signifying the duty of the knight to be pure and free from all vice and a lover of the four Cardinal Virtues; Prudence, Justice, Fortitude and Temperance, through which he should seek honour. Shaking Fra’ Paul’s shoulder, the Grand Master urged him to rise and, while standing, two attendant knights touched his heels with golden spurs. With these he was reminded that he must keep a spur in his heart to urge him to the virtues and the service of God. Their touching of the heel, the lowest part of the body, serving as a reminder to hold gold and avarice always in contempt. This initial element of the ceremony concluded with the Grand Master handing him a lighted candle with the instruction to go with the Grace of the Holy Spirit to hear the word of God, the Gospel. 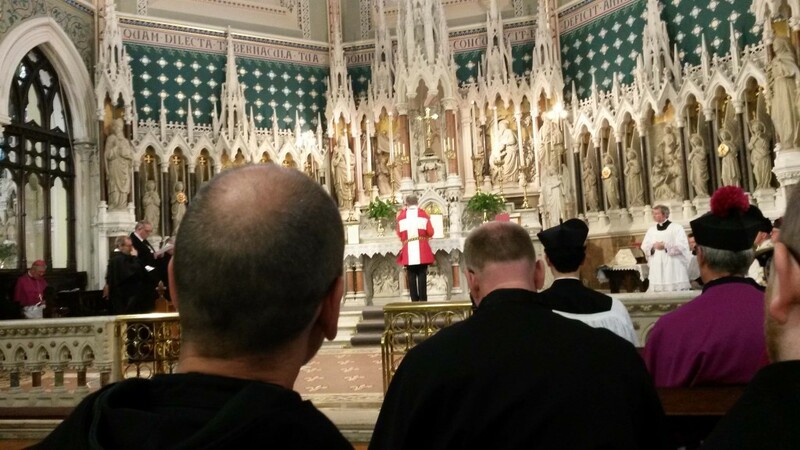 Following the homily, the Canon of the Mass and Holy Communion the congregation again sat for the Ceremony of Clothing, whereupon Fra’ Paul presented himself again to the Grand Master. Asking to be ‘counted worthy to enter the Order of Brothers of Holy Religion named after the Hospital of Saint John of Jerusalem’ he confirmed himself willing to obey his superiors in the Order, to live in chastity and that at no time previously was he a professed member of any other Religious Order. Finally, confirming himself free of any marital obligations or obligations to other men ‘either of personal security or of significant debt,’ the Grand Master formally admitted Fra’ Paul to the ranks of the Professed Knight of Justice. In keeping with the gravity of the undertaking and tradition, he was reminded that this was done with the proviso that if any part of his declaration should prove untrue, then, ‘with great shame’ he would be stripped of his habit and expelled from the Order. A Missal was then presented to the Grand Master by an acolyte, opened at the beginning of the canon and, placing both hands on the Crucifix, Paul Edmond Matthew Caffrey thereupon made his Profession and became a full Religious member of the Order. 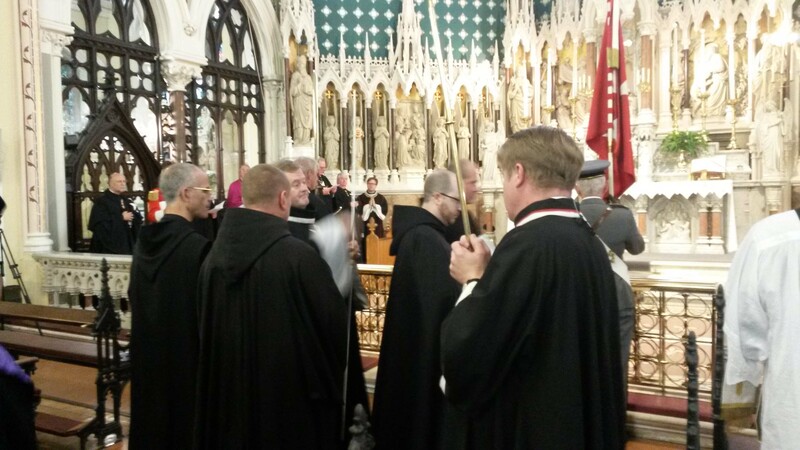 As his first act of obedience, in accordance with tradition, the new monk-knight is presented with the missal and instructed by the Grand Master to take it to the Altar and return again with the same. As his second act of obedience, he was charged with reciting daily the Office of the Blessed Virgin Mary, or the Office of the Dead or five Decades of the Holy Rosary. 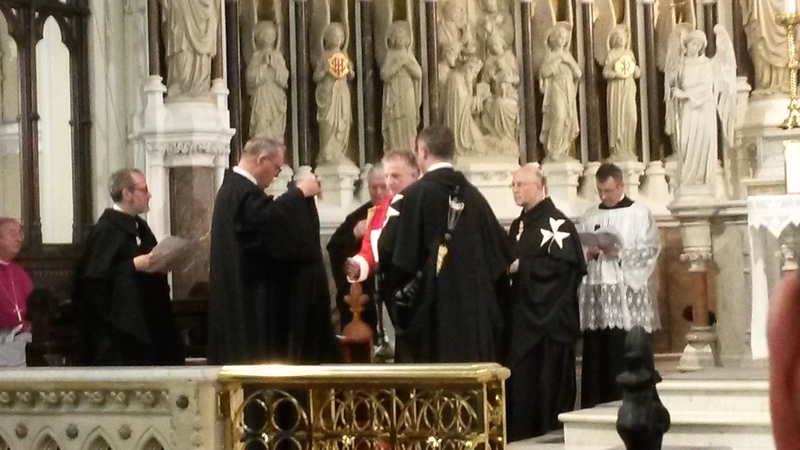 Fra’ Paul executing his first act of obedience as a Professed Knight. 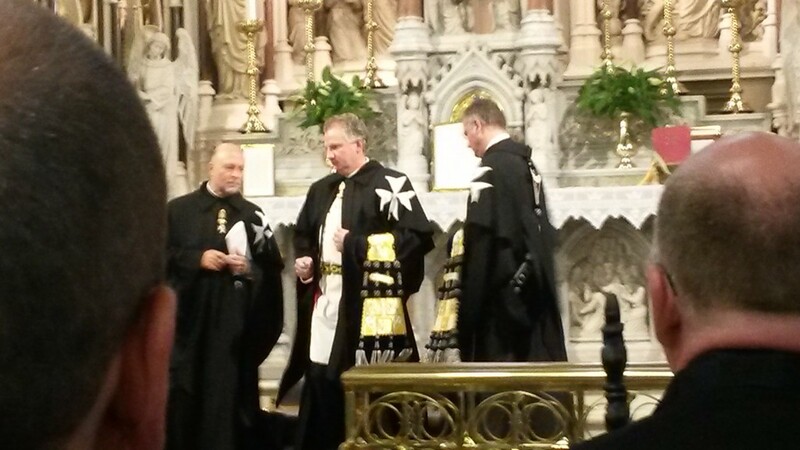 The clothing aspect of the ceremony is completed when the Professed Knight is presented with his habit and stola. The habit, he is told, is to remind him of the garment of camel-hair worn in the desert by Saint John the Baptist for his penance. Henceforth Fra’ Paul was to wear this habit as a penance for his sins. Again elements of the habit have in themselves symbolic meaning. Its sleeves, he is also informed, are not only to bind him but to remind him of his obedience to the Order and the defence of the poor and sick. Similarly, the eight-pointed Maltese cross upon his habit should remind him of the eight Beatitudes and is worn over the left side, over the heart, so that the knight may defend it with his right hand. 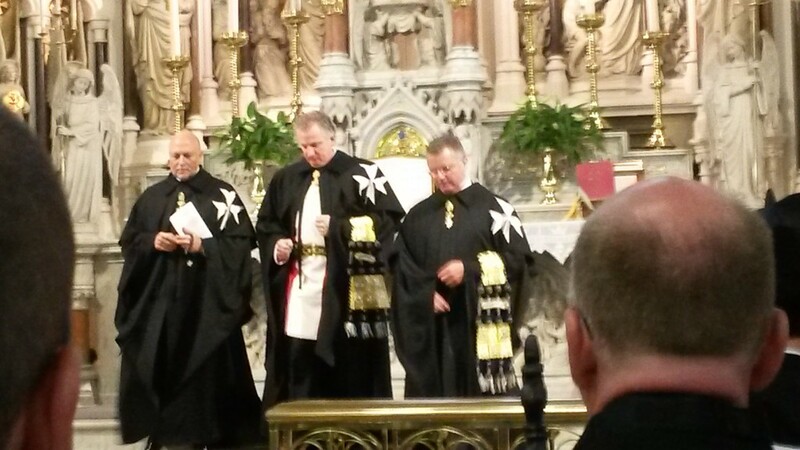 The habit was then placed upon Fra’ Paul by the Magistral Chaplain and Master of Ceremonies alongside the Grand Master. Finally the stola was presented and placed about Fra’ Paul’s neck by the Grand Master, its embroidered imagery calling to mind the suffering and Passion of Our Lord. Fra’ Paul escorted by two other professed knights returning to their places at the conclusion of the clothing ceremony, the stola draped over his left arm. Following the Last Gospel, the singing of the Inviolata to the Blessed Virgin and a simple prayer for the Grand Master ‘Domine, salvum fac Magistrum et exaudi nos in die qua invocaverimus Te’ the members of the Order recessed out of church, the Prince and Grand Master preceded by the Sword-bearer and Director of Ceremonies. Fittingly, throughout the ceremony was heard the strains of William Byrd’s Mass for Four Voices, composed about 1592 during a period of intense Catholic persecution in England. 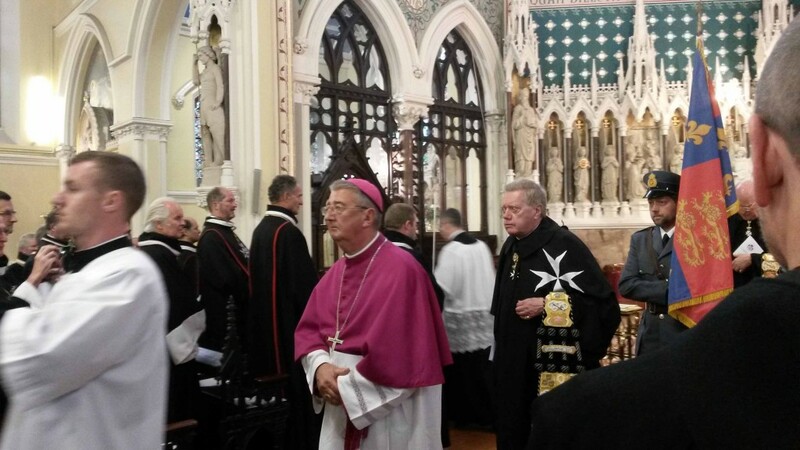 The Archbishop of Dublin, Dr. Diarmuid Martin followed by the banner of the Langue of England. The newly Professed Knight in Perpetual Vows leaving the sanctuary, still carrying his lighted candle. For more than nine hundred years the mission of the Order has been ‘the promotion of the glory of God through the sanctification of its Members, service to the faith and to the Holy Father and assistance to one’s neighbour‘ and the Professed Knight of Justice has always been the beating heart of that mission. Despite often violent upheavals in its past the Order today continues its historic mission across more than one hundred and twenty countries, caring for people of all religious faiths and of none with the help of its members, volunteers and employees. Following the loss of the Christian controlled lands in the Holy Land the Order came to be based on the island of Rhodes from the early fourteenth century as a bulwark against the advancing Turks. Following the loss of the island in 1523 the Holy Roman Emperor granted the islands of Malta (and the fortress of Tripoli) to the Order in 1530. The then Grand Master reluctantly took possession of the arid islands and from there continued to serve the sick while defending Christendom from the Ottoman Empire and Barbary pirates. Having successfully defeated an overwhelmingly larger Turkish force during the Great Siege of Malta of 1565 and the Battle of Lepanto seven years later, the Ottomans were deprived of what would have been a strategically vital naval base whence to push further into Europe. When one thinks of the numerous memorable episodes from the Order’s long history it is difficult not to admire the doomed defenders of the small fort of St. Elmo during the Great Siege who refused to leave the battered fort for fear of dishonour and those badly wounded knights who, of the remaining sixty left, facing certain death and too weak to stand, sat propped on chairs and a log on the beach with weapons in hand ready to face the final onslaught of the entire Turkish army. 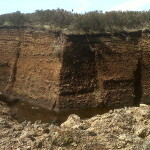 Their stubborn defence bought valuable time for their brethren defending the rest of the islands. Or the seventy-one year old Grand Master Fra’ Jean de la Valette, seriously wounded but still refusing to leave the battlefield at Fort St. Michel. Their successful defence of Malta against the overwhelming numbers of the Turks proved a significant upset to the Turkish advance into Europe and, although not a decisive defeat, such was its significance to Christendom at that time that thanksgiving services were ordered not only in Catholic realms but in Protestant England. 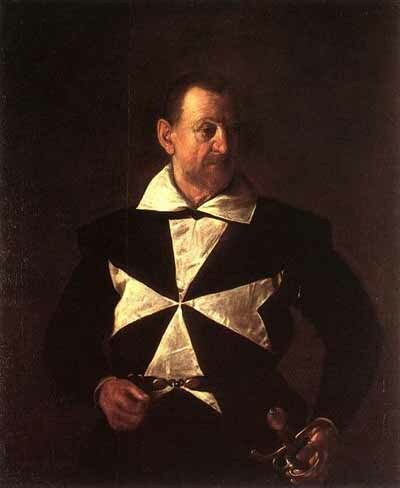 Caravaggio’s portrait of the seventy-four year old Fra’ Antonio Martelli, a distinguished veteran of the Great Siege. 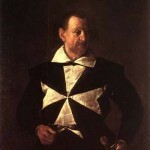 Among the most famous of portraits of a Knight of Malta, it was painted by the artist about 1607 during his time on the islands and for some time erroneously believed to have been a study of Fra’ Alof de Wignacourt, 54th Grand Master of the Order. The subject’s left hand rests upon his sword while in his right he holds his rosary beads. The Knights were eventually expelled from Malta in the last years of the eighteenth century by a French force under Bonaparte. 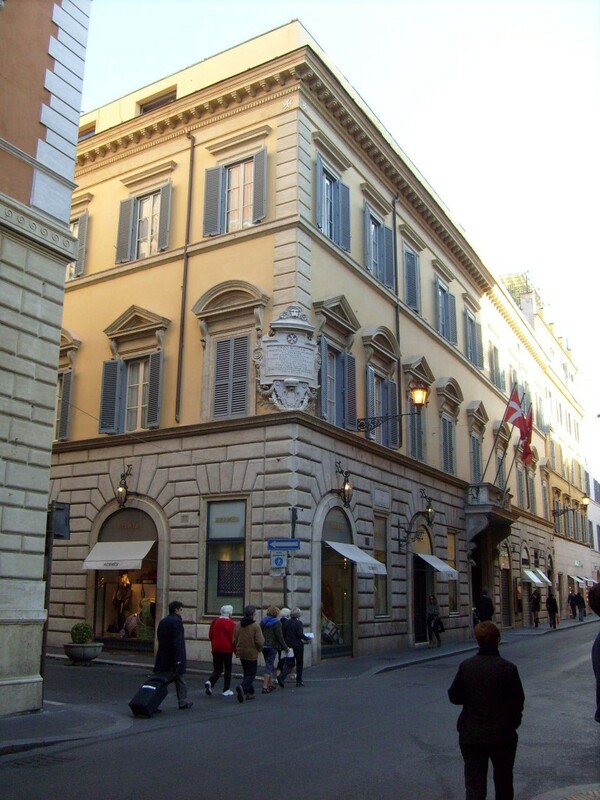 Retaining its sovereignty under International law the headquarters of the Order is now based in Rome at the Palazzo Malta on the elegant and highly fashionable Via Condotti. The Palazzo Malta on Via Condotti, not far from the Spanish Steps. Both the Palazzo Malta and the Order’s villa on the Aventine Hill in Rome are extra-territorial and constitute the world’s smallest sovereign state. 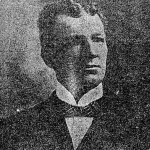 With regard to East Galway, if one excludes the role of various Priors of St. John of Ireland or Priors of Kilmainham in the governance of Ireland in the medieval period or the membership over succeeding generations of such prominent families as the Counts O Kelly of Gallagh and Tycooly in the modern period, the Order has a distant connection with the region and specifically with the parish of Ballinakill in the diocese of Clonfert in South East Galway. 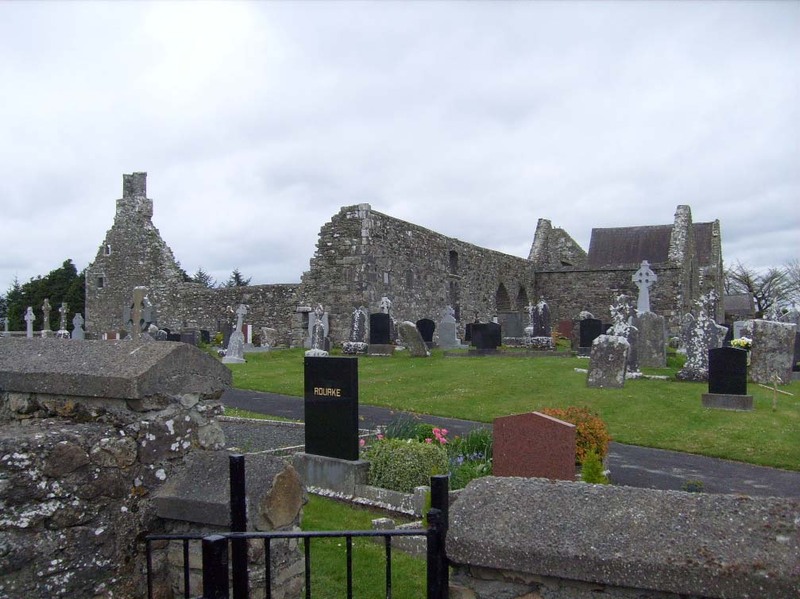 That parish is believed to equate to the district once known as Kineleghen or Kilnalahan, where the Carthusians founded a small monastery in the early fourteenth century that was acquired by the Franciscans later in that century after it fell vacant. Despite the presence of these Religious Orders locally, it was the Knights Hospitallers who acquired the rectory of that parish and its revenues at some stage in the fourteenth century. 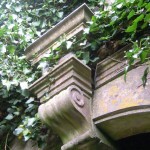 They established a preceptory there under the immediate authority of the Prior of St. John’s of Ireland. The preceptory was located at a significant remove from the Knight’s parent house at Kilmainham and from that region about Dublin known as the Pale to which the immediate power of the Crown was restricted in the late fourteenth and fifteenth century. 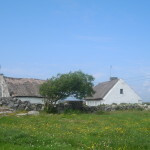 It is believed unlikely that they ever maintained a presence at Kilnalahan for any significant length of time and may have allowed the Franciscans to carry out their parochial duties there in their stead. The ruins of the Franciscan friary of Kilnalahan in the village of Abbey in South East Galway. 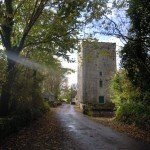 Despite the decline in the Anglo-Norman colony the Knights retained legal ownership of this remote living into the sixteenth century and as late as 1529 Sir John Rawson, Prior of the Hospital of Kilmainham and of St. John of Jerusalem in Ireland gave power of attorney to the Galway merchant Stephen fitzJames Lynch to grant leases of all the lands and tithes held by the Hospital in Connacht. 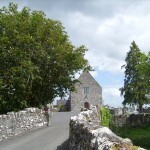 Included in the grant, in addition to various lands in the Archdiocese of Tuam, were the tithes of Kilnalahan in the diocese of Clonfert. Not long thereafter, however, in common with other Religious Orders in Ireland, the Order was suppressed in the mid sixteenth century by the English Crown. Unlike the present Prince and Grand Master’s maternal ancestor Blessed Adrian Fortescue and his martyred brethren, Sir John Rawson negotiated with King Henry VIII and surrendered the Priory of Kilmainham and the Order’s property to the Crown in 1541 for a significant sum of money and a title, facilitating the dissolution of the Order in Ireland. It would be more than four and a half centuries later before Ireland would produce a Professed Knight of Malta in Fra’ Paul Caffrey.